So low key that it's unsatisfying. Cronenberg just can't get into the subject with sufficient depth, and this is submerged beneath his overbearing style. Hardly surprised, as A Dangerous Method suffers from the same problems, except that one also lacked for style. Barely made it through this. It had dull pacing, a bland aesthetic, and Ralph Fiennes is a hack. I guess I can't say I was quite as bored as I was with Dead Ringers though. I appreciate the attempt at slow burn suspense and the gradual unwinding of truth, but somewhere along the way my mind went a wandering and never really came back with any sort of satisfaction. This is the exact way to depict Oedipus complex and its possible reaches. A technical masterwork that ranks among one of Cronenberg's most intricately plotted, with visual storytelling and essential symbolism. 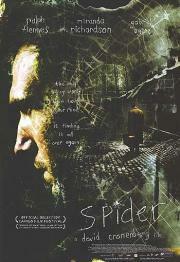 Spider's web falls apart when the technical side never gets to completely eclipse with the screenplay. Every scene is a slow dance to a point realized two steps in. The thriller format proves to be poor as the film never manages to attach thrills to any of its scenes due to how misaligned the plot is with the narrative. An impressive, palpably unimportant bore. Unreliable narrator or not, much of the dialogue seemed too obvious, added to the heavy symbolism it came across very stage-play. The voyeuristic way a lot of it was shown distanced, so lessened the impacts of the psychotic effects. A relief for some perhaps but, as a fan of paranoia in cinema it left me a little frustrated.